In the garden, there is much to do this time of year. There is ongoing clean up with falling leaves, and some plants need to be dug and stored. The flower beds will get a covering of mulch, making sure to keep the rhizomes of the irises clear. If you compost plant materials, this is a great time to add to your bins. 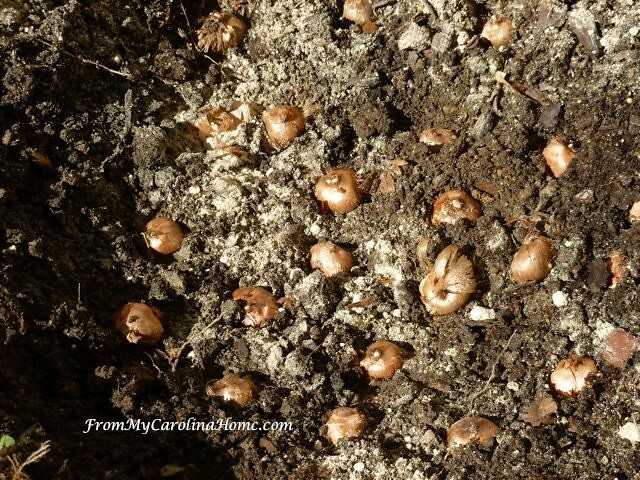 October is also the ideal time for planting bulbs for color next spring. If you plant by the moon cycles, this weekend (19th-21st) is the most favorable for planting above ground crops, which I assume would include flowers. The next best time is October 28 and 29, which is good for seed beds and flower gardens. After that is November 6-7, if it isn’t too cold in your area by then. Clear out a section for your bulbs, dig down about three times the height of the bulb, then spread some bone meal for the extra phosphorus to aid in flower formation. Place the bulbs root side down, and cover. Last year I think the squirrels got some of my daffodil bulbs, so this year I am adding some wire mesh to help keep the critters out. Some flowers are still going, mainly because it is still so warm. By now we should have been in the 40s at night and most of these flowers would be gone. Wildlife is a bit more abundant on our mountainside in the fall, as migrating animals come through and others are looking for a good meal before hibernating. 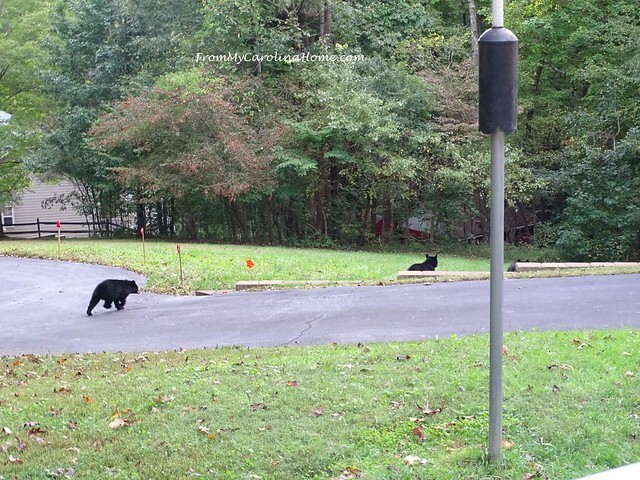 Just this past weekend, I was surprised to see a mother bear and two cubs in the front of the house. I eased out to the veranda with the camera to try to get a better picture, as they were pretty far away on the retaining wall. Mom must weigh close to 300 pounds. They all scampered off pretty quickly, they are more afraid of us than we are of them. The cubs were really cute, probably around 100 pounds each by now. 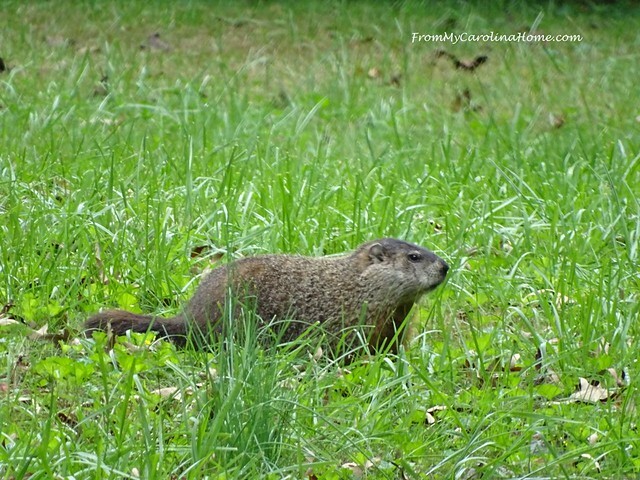 Then, that same afternoon, our local woodchuck visited the meadow for a meal. And the little turkey flock is still coming by for a handout on almost a daily basis. The male really does believe himself to be quite special. So, of course I tell him he is a handsome fellow, and he puffs and preens even more! Anyway, back to the garden, it is time to bring in and store the large bulbs in planters like the Curcuma Ginger. These need a dormant time, so I’ll cut off the yellowing leaves and put them in a dark cool area to rest for a few weeks. I am hoping to get more amaryllis flowers out of both these bulbs. Not all amaryllis need a rest period, but mine seem to need about 8 weeks, then another 8 to bloom. 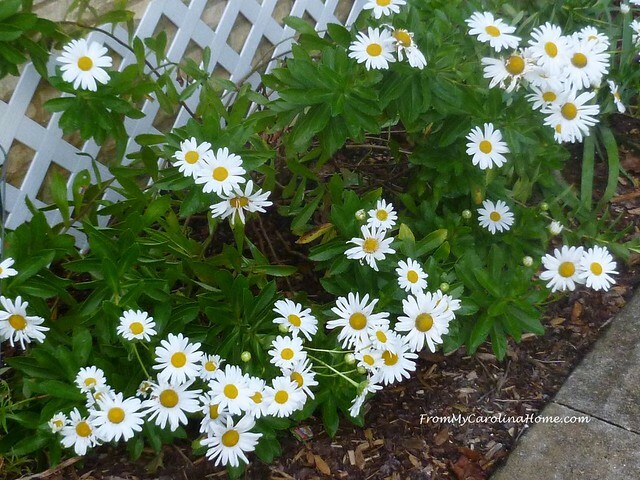 Starting now, I hope to have blooms by mid-February when it is cold outside and nothing else will be blooming. My Thanksgiving Cactus will bloom next month, so I bring it inside to the kitchen to keep it from getting too cold at night. I’ll give it more water now and a bit of fertilizer too, to encourage the blooms. 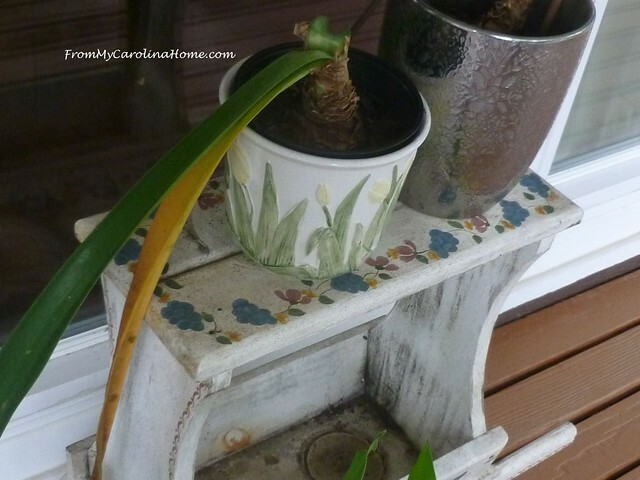 I use Miracle Grow liquid (a few drops in the watering can) for my houseplants. Now is the time to stop watering the begonia, in the hopes I can dig the tubers and have them survive over the winter. I have two that are still blooming profusely, but I need to let them dry out and die down a bit before there is a killing frost. Naturally, I didn’t move them under cover, and it rained this week, so I’ll have to wait a bit longer and hope it doesn’t freeze. 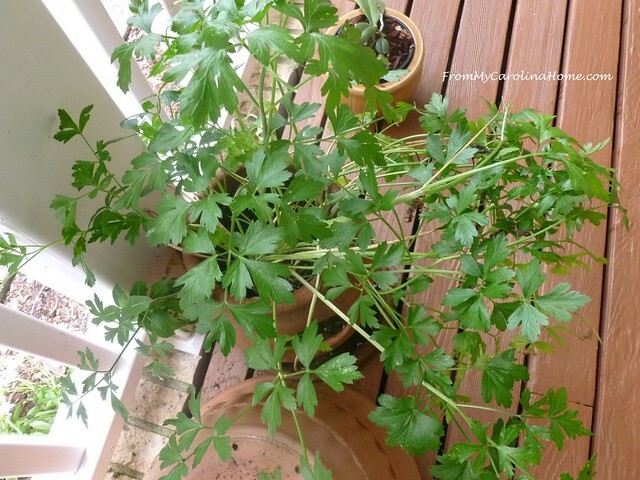 For my fresh herbs like this parsley, I want to get them cut and frozen before we have a frost. 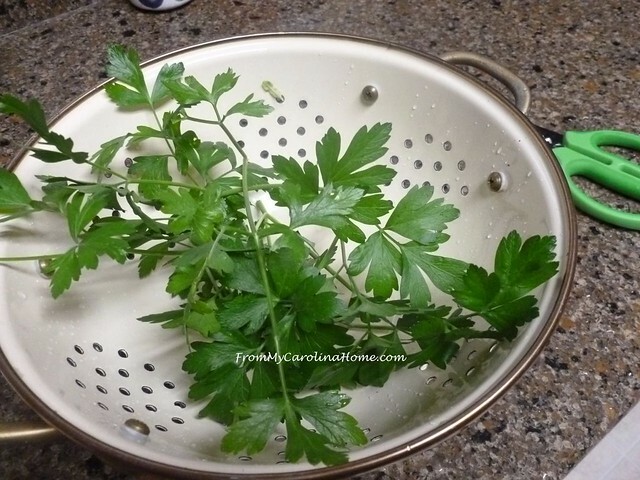 I remove the pretty and flavorful leaves, washing them thoroughly and discarding the stems. 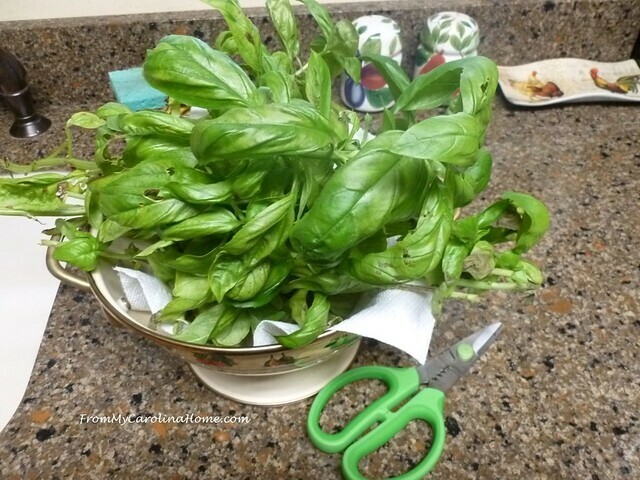 I do the same with all the remaining basil. Pat the leaves almost dry, leaving just a tiny bit of moisture inside the bags. Store in the freezer. The advantage to this is when the leaves are completely frozen, they will break up and crush very easily. Add the herbs to whatever dish you like. The flavor is bright like fresh herbs when used. Be sure to label your bags, as the crushed bits all look the same. 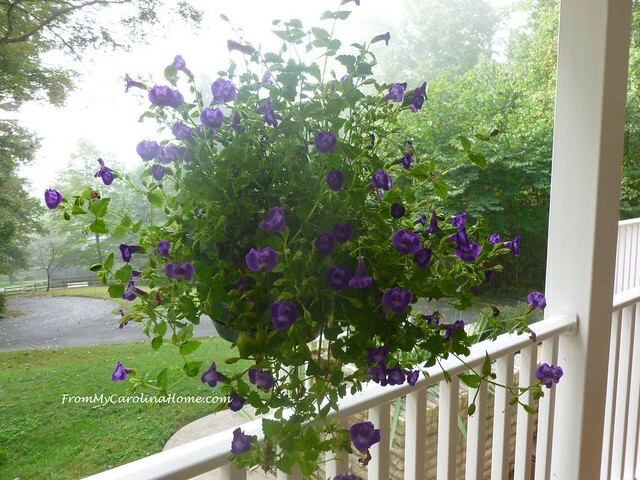 Back to the veranda, I’ll keep watering the true annuals to have nice foliage and a few more flowers before winter. The torenias will last until a hard freeze. Now inside, I have a little garden in the kitchen now, with the Thanksgiving Cactus and my two African violets. This year I might try to keep a couple of fresh herbs inside as well. I’ll have to figure that out over the next few weeks, see what I have in seeds, and maybe try to save some of that parsley. New Autumn Jubilee giveaway sponsor Costa Farms is going to send a gorgeous Red Aglaonema houseplant to a lucky winner for today’s gardening post! The plant has such pretty color leaves, perfect for Autumn. Due to legal restrictions, they cannot ship to California, Arizona, Nevada, Hawaii, or locations outside of the United States, but everyone else is eligible. See their website for an outstanding plant finder with an awesome amount of information on growing all kinds of plants. To enter, leave a comment on this post, then click on the button below to enter the drawing. What is your favorite houseplant? Happy Pumpkins Tablescape and Recipes! I like any type of houseplant! I have a couple of potted trees that I bring in also. My favorite house plant is my Christmas cactus. It now has tiny blossoms and I’ll have some color soon. 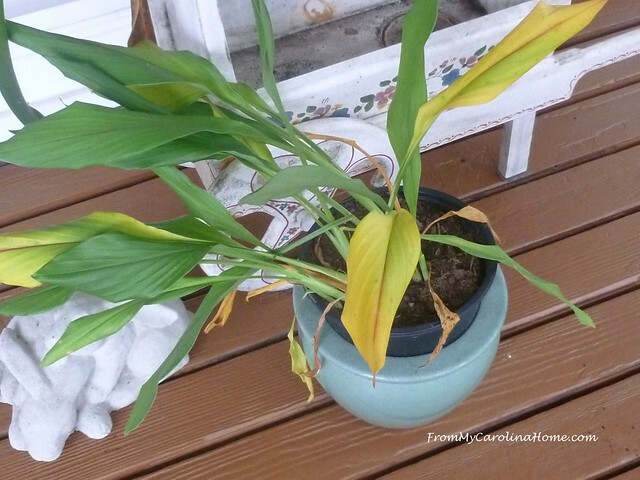 Well, I love houseplants, but do NOT have a green thumb! However, I would say African violets are probably my favorite along with my Thanksgiving/Christmas cactus that seems to bloom whenever it wants! Usually when it’s supposed to and then at various times in the year! It lives in my kitchen window. 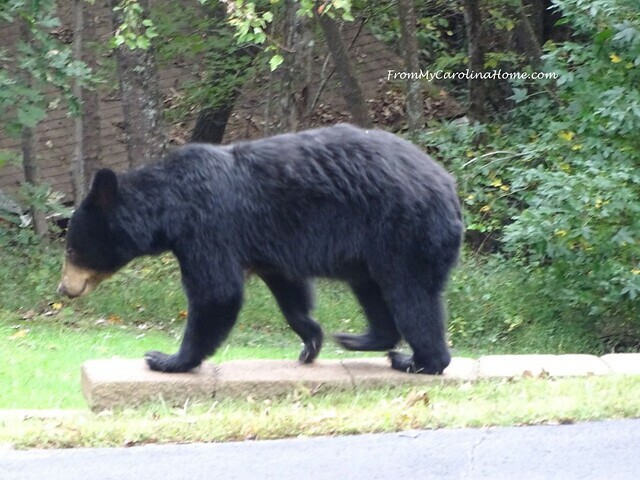 I personally wouldn’t want any bears in my yard, thank goodness they are not common in our area. Now the turkeys yes, I had a group of 24 come through the yard at three different times yesterday. Enjoy looking at the wildlife in your yard. A great reminder that I need to get busy with my plants. I have 2 special Christmas cactus, that I inherited from my mother in law years ago I always enjoy seeing them bloom. Its 40 degrees this morning. Thanks for the reminder about planting bulbs. I need to get busy and plant mine. Thanks for the post. 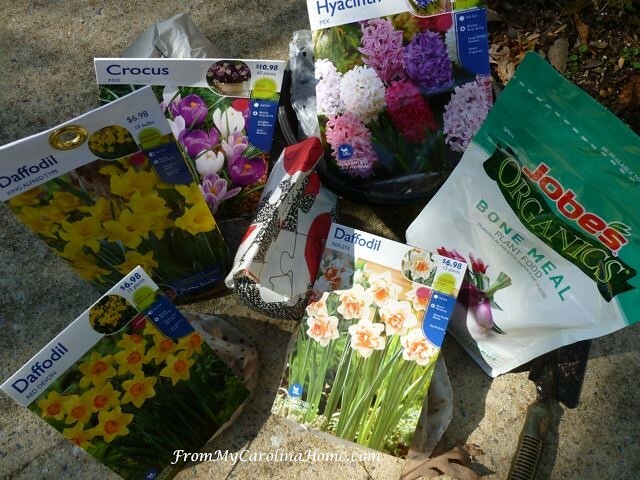 It made me think about it that I need to plant more bulbs. I will go out and buy some today to plant this weekend. My favorite houseplant is my African Violet. It has been doing so well the past few years. I brought it into the house yesterday. Thank you. Fun writing and photos, Carole! My favorite houseplant is burro’s tail. I have orchids and Christmas cactus as my favorites. I enjoyed this post very much. The first thing I do in the morning is to head out to my yard to visit the flower beds. My favorite house plant is the umbrella plant. Carole, the bears that visit you are amazing. It is supposed to frost here next week, so my garden will be put to rest. Happy weekend! 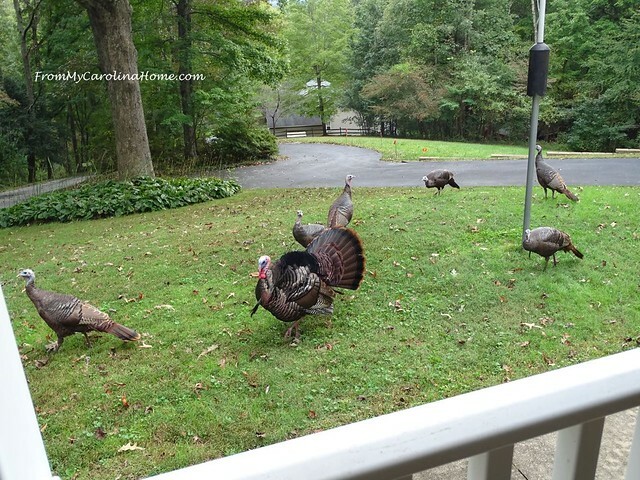 I love seeing the bears and turkeys on your property. I live in the suburbs and we only have deer and foxes. OM/GNESS!!! Bears in the front yard??? OK, turkeys and woodchucks I can see, but BEARS??? Whoa! 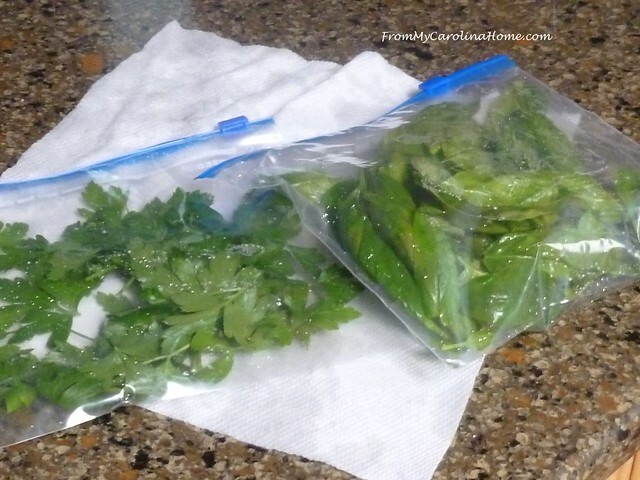 Thanks for the tips on freezing herbs; I love to have herbs in patio containers for the summer, but I have not been happy with my preservation methods. Will try this for sure. And, unfortunately for me, our house sits at odds with the sun, so no houseplants have survived. But enjoyed looking at yours. I pretty much like all houseplants with spider plants & African violets probably my favorites. I’ve got a plumeria tree that I’ll have to bring in for the cooler Fall until it warms up in the Spring. It’s Hawaiian. 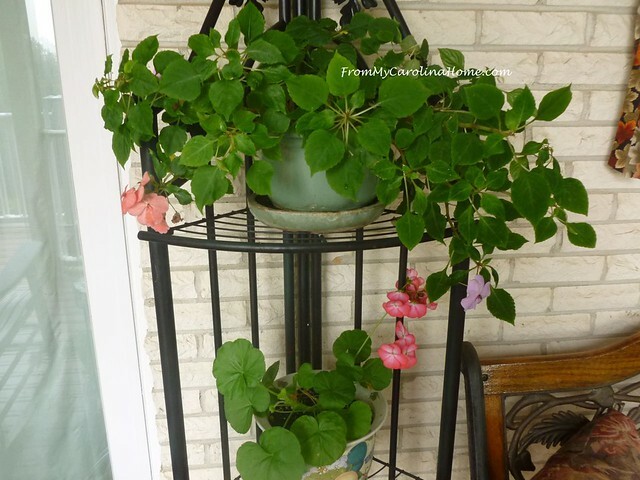 I also will be bringing in my pot of sweet potato vines and the two hanging pots of lantana. They’ve been overwintering for years now in my basement. Thanks for the reminder of bulbs. I want to plant a few more tulips in my tulip bed and if I find a few more daffodils, crocus, and/or hyacinths I’ll add more of those also. Have a great day! My favorite houseplants are my orchids. My so. Gave me my first one and I got two more at my retirement. They are tricky but my DIL has taught me how to care for them. They are getting ready to bloom again. Beautiful post Carole and I loved seeing the bears-how special is that! When it comes to houseplants, my green thumb withers and dries up, but I have been able to keep a gifted, pear shaped terrarium alive and thriving for 3 years now. We brought our citrus trees in about six weeks ago, and they seem to have adjusted well. Our garden is cleaned out and we have just a few pumpkins left to give away and seven to dehydrate, before we dig potatoes. I am going to check the carrots again this weekend. Their tops look great in spite of four snows, so we are letting them get a bit more size during this week of warm weather. I’m hoping we are completely finished by the end of the month. I love plants but can’t grow anything that blooms except hosta. My favorite houseplants are arrowhead vine and philodendron. What a lovely yard you have (and home too). I’ve never ever seen a woodchuck, except on tv. Way cool to have one in your yard. 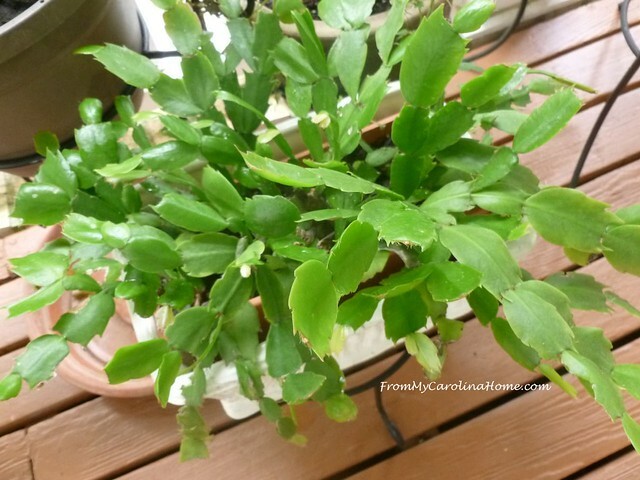 For indoor plants, I think I like just about any but a Christmas Cactus always has a special spot in my heart. My only houseplant now is a Philodendron that I had on a filing cabinet where I worked for 40 years. I brought it home with me and it is still going strong with cutting back and repotting. I’m not so good with Christmas Cactus, only last couple years. I really enjoy your postings. Wow! That must be something to see bears in the yard! Scary and exciting! We are indeed into fall, getting prepared for winter. The woodpile is in good shape and we’ll be burning in our stove before you know it. The leaves are falling from the trees and have beautiful colors. I think we’re ready. I do much better with houseplants than outdoor ones. I have a couple favorites, the Snake Plant which I have actually had bloom and the Umbrella Tree. 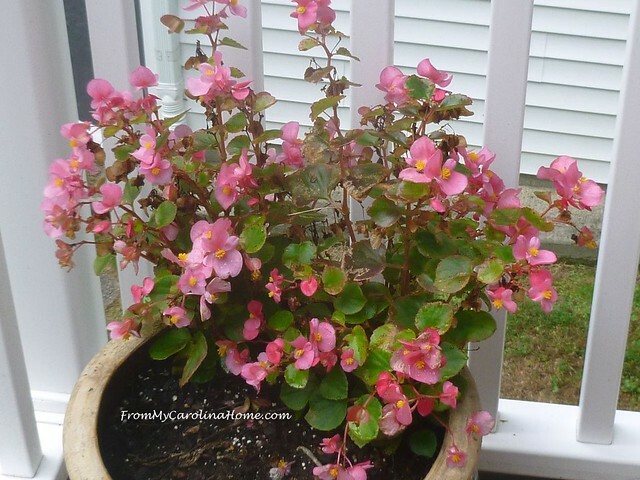 I have a rose begonia that I have had good luck with–beautiful rose colored blooms–also a good variety of succulents–I have a North room with windows on all three sides but south and plants seem to like it! Thanks for the inspiration! I love gardening. African Violets are my favorite. I love my philodendron. It’s in a sunny window and cheers me all winter with thoughts of spring coming. Wonderful to see the critters passing your place. We have that Thanksgiving cactus outside, mine is covered in buds, soon it will have deep red flowers, looks so good when it flowers. My garden does, indeed, need attention, but I haven’t brought myself to give it any yet. My favorite house plants are my orchids ( I have 7), but I also have both Thanksgiving and Christmas cacti (8 altogether), 1 Easter cactus, and several African Violets. While bears have been seen in the area, fortunately they haven’t visited us, but the deer more than make up for the lack of bears, and the squirrels are busy burying black walnuts everywhere. Still no killing frost, but it’s coming this weekend. My thumb isn’t very green. I do like African violets, they remind me of both my Grandmas. I noticed that where you speak of annuals the photo shows an Impatiens and a Geranium. I have Geraniums that are quite a few years old. I usually leave them outside (under cover) during winter, but I brought several pots into the house a couple of months ago and after I cut back their leggy bits, they will be ready to go outside again. I have also been growing Geranium cuttings on a window sill. I don’t grow Impatiens at present, but in the past I used to keep them from one year to the next by taking cuttings and keeping them inside during the cold weather. I love you wildlife photos. I wish mine would do that, I have tried several times to overwinter geraniums and failed every time. I like my Thanksgiving cacti (I have 4 now since dividing them this summer) because they bloom off and on all year long. Summer, fall, winter or spring they just happily surprise me with blooms at any time. Being succulents they don’t need much care so my kind of plant. 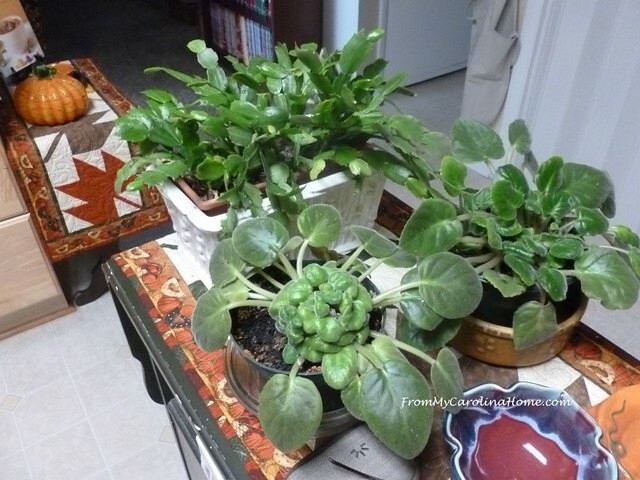 Pothos, especially golden devil’s ivy, it can be started from a cutting! Easy to grow & keep alive! My favorite houseplant has become my Peace Lily. It was a gift from my youngest daughter when her job took her to China. The first year, it almost died and I just couldn’t let that happen. After cutting it back, moving it around the house till I found just the right spot that the plant loved, and keeping it moist but not saturated, the plant is now thriving. My favorite houseplants are my Christmas Cactus/Thanksgiving cactus. They are full of blooms right now after being outside for the summer. Wanted to share that I am enjoying a second crop of purple hull peas ! Hubbie bush-hogged spent summer crop in early August, and volunteer plants grew back.I put an additional 5 quarts in freezer last week! Wonderful extended growing season! I always love your nature reports. 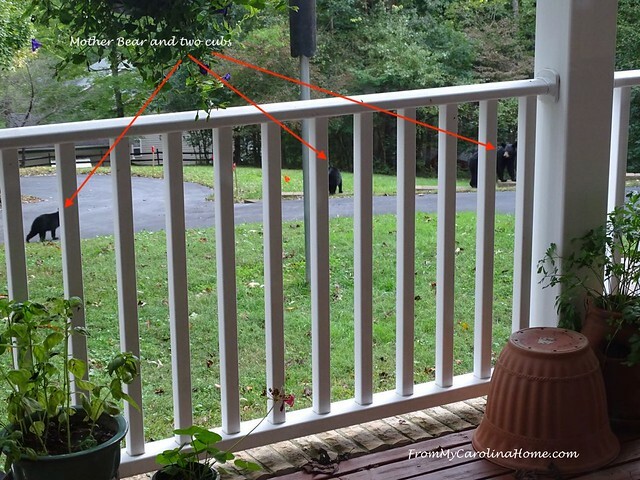 I am not sure I could get used to the possibility of bears stopping by my yard! You have such a lovely setting there and so many great plants. I do not think I can choose a favorite houseplant. I just brought all my succulents inside as it is cold here at night already. My thanksgiving cacti are in bud and I am looking forward to blooming, as the one is a baby I propagated (Which hasn’t bloomed before) and the other dropped its blooms last December when I bought it and brought it home. Your lawn looks like A wildlife preserve!! Carole, may I ask how much land comprises your place? It looks like a lovely layout. 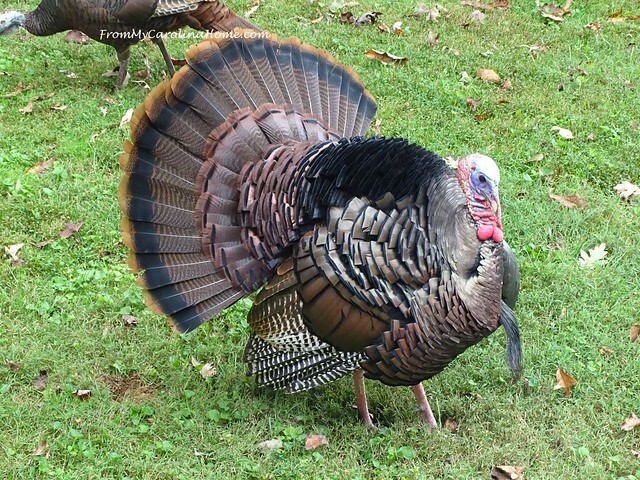 We live in the country here in central Texas, so we see turkey and deer frequently…..and wild pigs, sadly! You appear to be at the edge of a woodland area. LOVE seeing the wildlife!! I think both the male turkey and the bear looked very impressive! My garden is a sad case…..another week before I dare get my hands in the dirt. Stitches are out, but still a little sore and raw! I need to do a major clean up. Definitely no rest in your garden with lots to be done. But worth it for the following seasons. I am impressed with the wildlife you have visiting. The bears are huge. What a great visit I enjoyed with you in your garden this morning. I’m just home from my yearly quilt retreat, and will settle into fall activities now. For me that includes moving home from the cottage and leaving my ocean behind for another season. Thanks for sharing your garden activities, and the visits from your neighbours. Have a beautiful week. Our daughter introduced me to Fiddle Trees. We are both trying to nurture one. I loved the bear photos. The wildlife population preceded humans building homes. I admire persons who enjoy seeing wild animals but who do not interfere with them unless they pose a threat to the well being of humans. I’ve missed keeping up with what you’re up to in your beautiful garden, Carole. My zygote cactus are in flower at the moment and the begonias are still flowering. Surprising that we have some of the same plants flowering at the same time. I know you said the bears are scared of you, but they would totally freak me out!! !